Understanding the anatomy of the ankle ligaments is important for correct diagnosis and treatment. Ankle ligament injury is the most frequent cause of acute ankle pain. Chronic ankle pain often finds its cause in laxity of one of the ankle ligaments and in built up of scar tissue in one or more of the ankle ligaments resulting from mini or partial tears after ankle injury. The most common mechanism of injury to the ankle ligaments is inversion of the foot. With this mechanism of injury, the anterior talofibular ligament is the first or only ligament to sustain injury. A total rupture involves the calcaneofibular ligament and the posterior talofibular ligaments as well. 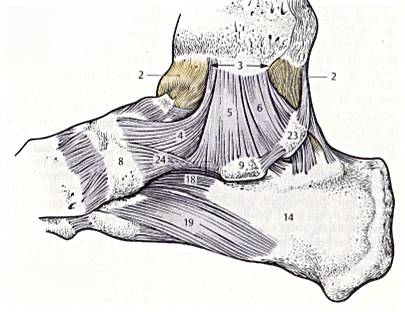 Ligaments of the tibiofibular syndesmosis that join the distal epiphyses of the bones of the leg (tibia and fibula). 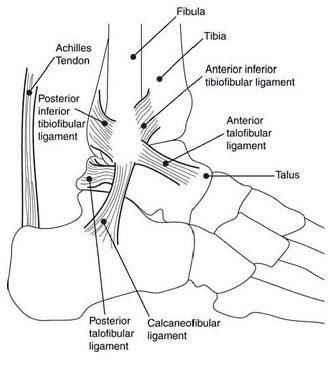 REMEMBER: The anterior talofibular ligament is the most common ligament to sustain injury! Twisting the ankle causes strain or tear in ankle ligaments. This trauma weakens the ligament, adhesive scar tissue builds up and the functional movement of the foot gets changed. In many cases it can be observed that people suffering with plantar fasciitis had a twisted ankle some time before. That suggests that treatment of plantar fasciitis should include treatment of the ankle ligaments. The treatment is carried out with frictioning massage of the lateral and medial ankle ligaments, transverse to the fibre, to break down scar tissue and get the normal function back.